In 1949, Karl Barth confidently upholds a high doctrine of divine providence, main-taining God's control of every event in history. His argument is at once cheerful, but also defiant in the face of a Europe that is war-weary and doubtful of the full sovereignty of God. Barth's movement to praise God shows his affin-ity for the Reformed theological tradition. While Barth often distances himself from his Calvinist predecessors in important ways, he sees his own view of providence to be a positive reworking of the Reformed position in order to maintain what he un-derstands as its most important insights: the praiseworthiness of the God of provi-dence and the doxology of the creature. Doxological Theology investigates how the theologian, in response to the praiseworthy God of the Reformed tradition, is ex-pected to pray his or her way through the doctrine of providence. 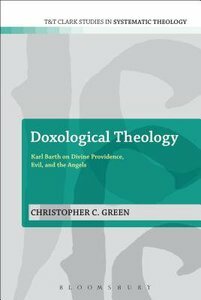 About "Doxological Theology (T&t Clark Studies In Systematic Theology Series)"
Christopher Green is professor of the history of art at the Courtauld Institute, University of London. He is the author of Juan Gris, Cubism and Its Enemies, and L$eger and the Avant-Garde, all published by Yale University Press.